Most electricians refer to grounded conductors as neutrals. A grounded conductor is defined in Article 100 of the N.E.C. as a system or circuit conductor that is intentionally grounded. For grounded electrical systems, Section 250.24 of the 2014 N.E.C. requires the neutral conductor to be grounded at the load end of the service drop or service lateral. Grounded is defined as connected to ground or to a conductive body that extends the ground connection. 250.50 requires all of the grounding electrodes listed in 250.52 (A)(1) through (A)(7) to be bonded together to form the grounding electrode system. When a grounding electrode conductor is used to connect the ground rod, metal underground water piping system, or reinforcing steel bars in the building footer to the neutral at the service equipment, that neutral conductor is grounded and is now referred to as a grounded conductor. As we commonly see, a neutral or grounded conductor must be identified by white or grey insulation or markings as specified in 200.4. Section 240.22 gives us two conditions, of which one must be met before an overcurrent device can be installed in series with a grounded conductor. The first requirement is that the overcurrent device must open all conductors of the circuit, including the grounded conductor. If a fuse blows in one conductor, it will not open the other fuses in the circuit. A fuse cannot be connected in series with a grounded conductor unless the second condition in Section 240.22 is met. 430.36 allows a fuse to be inserted in series with a grounded conductor when fuses are used for overload protection of motors. This section reads that, “…where fuses are used for motor overload protection, a fuse shall be inserted in each ungrounded conductor and also in the grounded conductor if the supply system is a 3-wire, 3-phase ac with one conductor grounded.” Placing a fuse in series with a grounded conductor is only allowed in this installation type when a fuse is used for overload protection of a motor. Be sure to note that the noncompliant installation being discussed only relates to fuses. 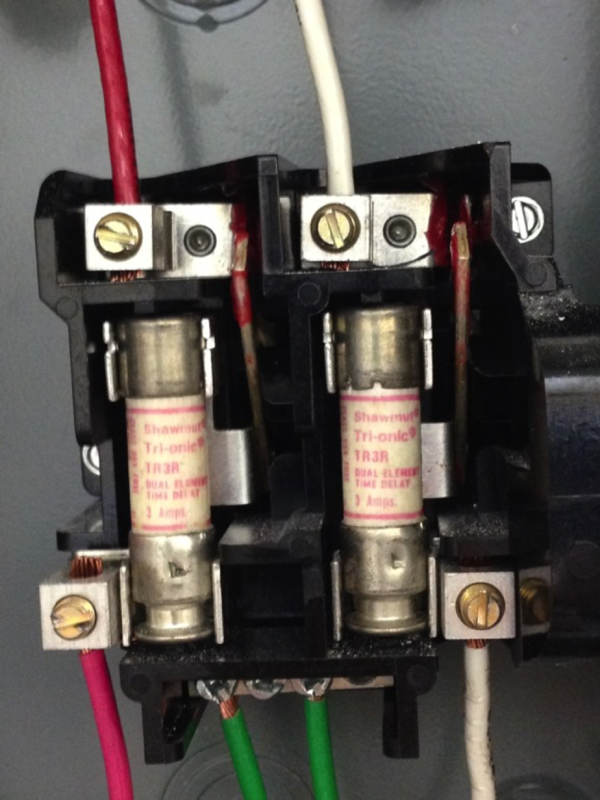 Section 240.22 applies to fuses and circuit breakers, but condition (1) of this section is much easier to comply with when a circuit breaker is used for overcurrent protection. In fact, circuit breakers with switched neutrals are commonly used to comply with Section 514.11(A) of the 2014 N.E.C. This portion of the Code requires a disconnecting means to be provided for all conductors supplying a gasoline pump. This required disconnecting means must also disconnect the grounded conductor of the circuit. A circuit breaker with a single handle, which disconnects the grounded conductor and ungrounded conductor simultaneously, is typically used to meet this section of the Code. 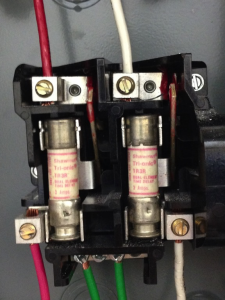 Overcurrent protection is a vital component of a safe electrical system. When sized properly and installed in the correct manner, overcurrent protective devices can protect equipment and property from the destructive forces of electricity. When installed incorrectly, they themselves can become a hazard. If a fuse installed in series with a neutral conductor were to blow, the connected equipment would cease to operate. A technician troubleshooting the equipment might use a voltmeter to verify the lack of voltage before beginning to work on the equipment. With a floating neutral, due to the blown fuse, the voltmeter would give a false reading of 0 volts present. Unless the fuse in the ungrounded conductor was blown as well, there would still be line voltage present in the circuit and the technician would face an unnecessary hazard. Safety is the primary purpose of the National Electrical Code. Electricians already have a very dangerous job without being introduced to additional hazards. Well-intentioned installations often create dangerous situations when unqualified persons are used to install or repair electrical equipment. Be safe and watch out for misplaced fuses.